This Valentine’s Day I’d like to share a little love with my readers so have teamed up with Bags To Go to offer you and your loved one leather wallets and an American Tourister Spinner Suitcase for your next romantic getaway. To inspire that trip I’ve rounded up my favourite romantic destinations around the world and am asking you to share yours in order to win the goodies. With its silky beaches surrounded by limestone cliffs, desert islands and emerald lagoons – Anantara Si Kao was made for romance! 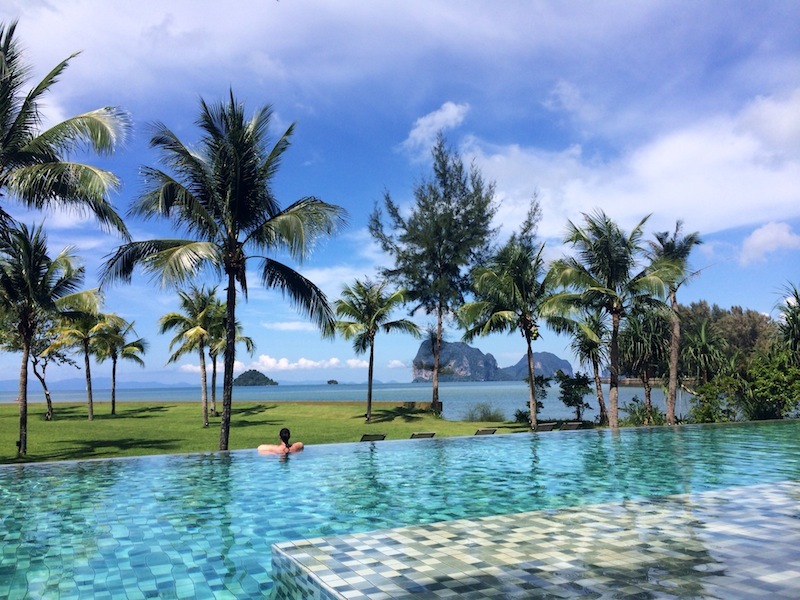 Situated 1hr30 from Krabi Airport, Si Kao is a secluded beachfront resort that has all the luxury without the tourists. Sea View Rooms offer dazzling views of the Andaman Ocean, even from the bathtub, and the adults-only pool overlooks the rocky outcrops that are famous in this part of Thailand. The hotel offers a speedboat service to nearby idyllic islands including Ko Mook, Ko Kradan (where they have a Beach Club) and the underwater Emerald Cave you can swim in. 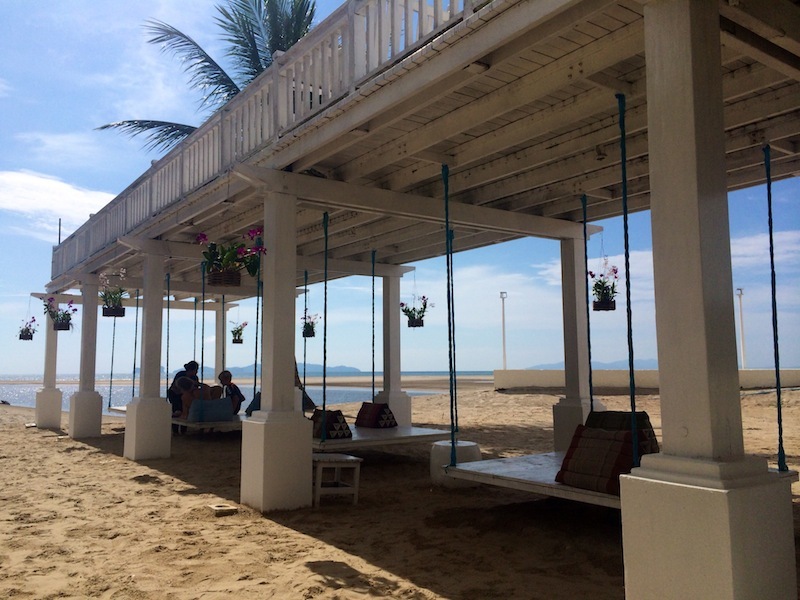 There’s also plenty of room for privacy on the hotel’s sweeping beach. It was on a fallen log on this silken sand that my husband proposed to me! Speak of romantic destinations and at some point the Maldives is going to get a mention. I was incredibly fortunate to honeymoon there last year and learned it more than lives up to its reputation. 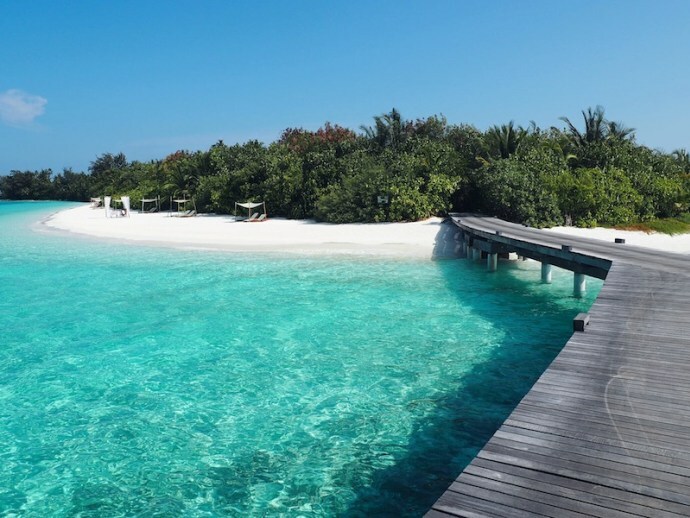 Looking just like it does in the brochures, the Maldives consists of dizzying white sands and warm turquoise waters. The ocean teems with coral and marine life, which at many resorts you can explore directly from your overwater villa. For those looking for ultimate privacy you need hardly leave your villa at Coco Bodu Hithi. With a private plunge pool to cool down and butler on hand to bring refreshments, the villa has everything you need, including manta rays, reef sharks and turtles swimming just beneath you. For those, like my husband, who like to stay busy, there’s a long list of romantic activities you can take part in including couples massages, sunset cruises, and candlelit dining on remote sandbank islands. It’s not only beaches that have oodles of romance but in Bali there’s a magic charm to the jungle too. Surrounding the cultural hub of Ubud are a smattering of luxury retreats hidden amongst the rice fields and valleys. 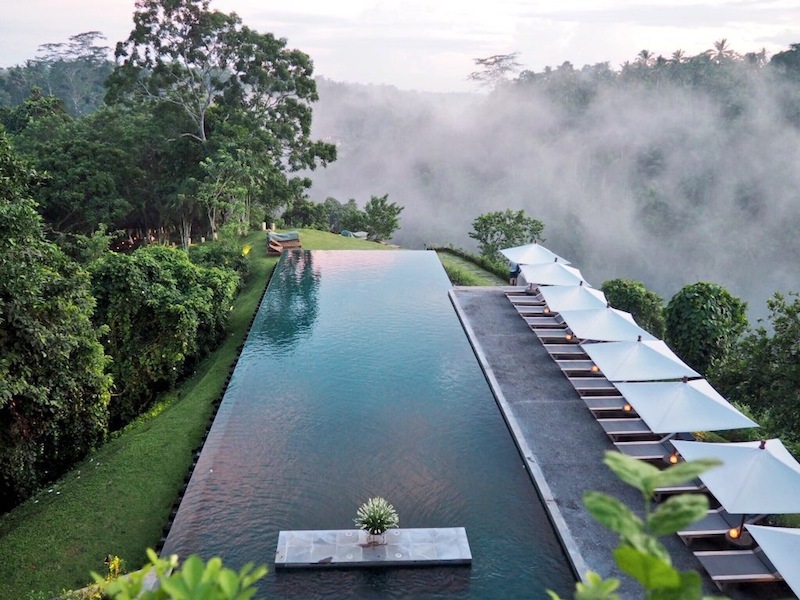 My favourite of these boutique hotels is Alila Ubud, which has secluded jungle villas and an infinity pool that juts out over the misty valley. Due to its hidden gardens and picture perfect pool the hotel is a popular choice for destination weddings. You just need to watch out for the friendly monkeys who like to frolic on the jungle villa balconies! For a romantic escape with a difference you can spend the night amongst a small groups of people on a pontoon on the Great Barrier Reef. Sleeping in swags (there’s a double one for couples) on the roof of the pontoon, you’ll awake to the fiery red rays of the sun as they first start warming the ocean. The benefit of being on the reef before the tourist boats arrive is that you can dive or snorkel without anyone else around you. On an early morning swim with your loved one you’ll feel like you have the Great Barrier Reef, and its thousands of multi-coloured fishes, all to yourself! 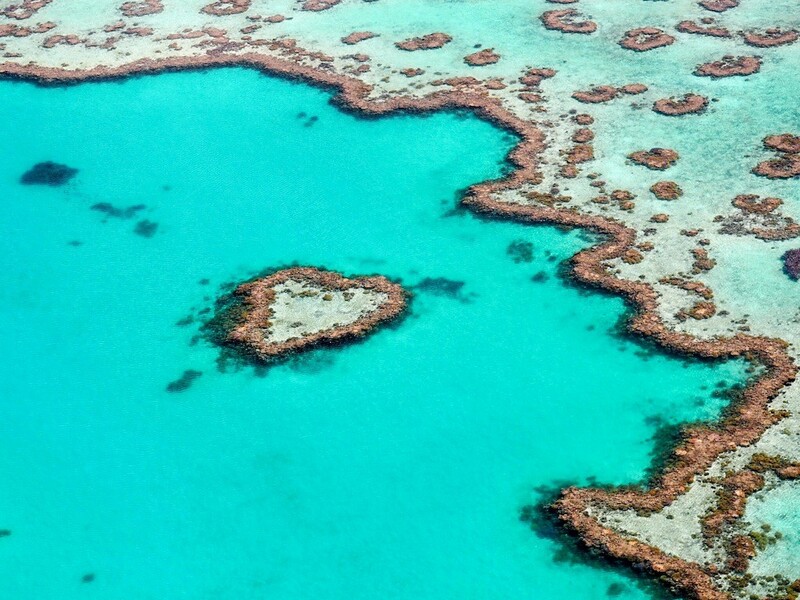 To up the romance factor book a helicopter transfer back to the mainland and you’ll pass the much-loved Heart Reef on the way home. I’ve teamed up with Bags To Go to kit you and your loved one out with the luggage you need for your next romantic escape. For your chance to win a Morrissey Leather Wallet, Serenade Botanics Floral Leather Wallet AND an American Tourister Bon Air Small Spinner Suitcase* simply follow the 3 steps below. Upload a photo to Instagram of the most romantic place you’ve ever been with a caption about what makes it so special. Include the hashtag #GTWBagstoGo and tag @jayneytravels and @bags_togo in your caption so we can see your entry. Follow me (@jayneytravels) and our contest co-hosts @bags_togo. *I have an American Tourister Bon Air and love it! I just convinced my sister to buy one too. They come in a couple of colour options and the winner can use the colour they want subject to availability. The contest runs from 30th January 2017 to 13th February 2017 and is open to Australian residents only. The winner will be chosen on account of their creativity and contacted via Instagram by 17th February 2017. Scroll down for the full terms and conditions. Entrants must complete stages 1 to 3 as outlined in the blog post for a valid entry. The contest is open to Australian residents only. Contestants should be aged 18 years and over. The winner may be required to validate their name and address in order to claim the prize by providing a valid ID and proof of address. The contest will run from 9.00pm Monday 30th January 2017 until 9.00pm Monday 13th February 2017. The winner will be notified via social media by Friday 17th February 2017. The winner must claim their prize within 2 weeks of receiving notification or a new winner will be drawn.